Who said you aren't a good test taker?! 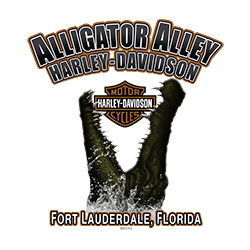 ALLIGATOR ALLEY HARLEY-DAVIDSON® IS A DEALERSHIP NEAR FORT LAUDERDALE, FLORIDA. WE OFFER A WIDE SELECTION OF NEW AND USED MOTORCYCLES FOR SALE IN SUNRISE, FLORIDA. WE OFFER FINANCING, A FULL PARTS & SERVICE DEPARTMENT AND MOTOR CLOTHES. VISIT ALLIGATOR ALLEY HARLEY-DAVIDSON® FOR ALL OF YOUR NEW OR USED MOTORCYCLE SERVICE NEEDS FOR YOUR SPORTSTER®, DYNA®, SOFTAIL®, TOURING OR TRIKE.